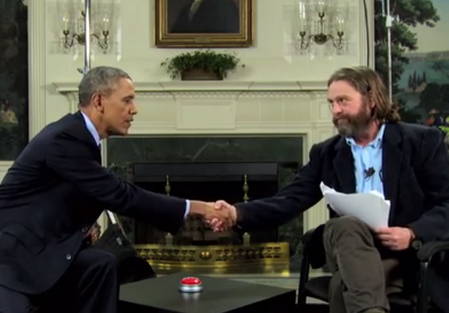 This just happened: President Barack Obama vs. Zach Galifianakis in an all-out trash-talk session in the latest episode of Funny or Die's Between Two Ferns. Say what you might about Zach Galifianakis as a comedian, we here at The Daily Zombies have always find his ‘Between Two Ferns’ talkshow at Funny or Die a consistent source of gut-busting humor. But when the President of the United States himself Barack Obama show up to trade insult with Galifianakis while ever-so-subtly plugging his Affordable Healthcare Act directed at the younger generation, everything changes. Or does it? Hit the jump to check out the hilarious, not to mention almost surreal clip featuring the full charisma of Obama, courtesy of Funny or Die.